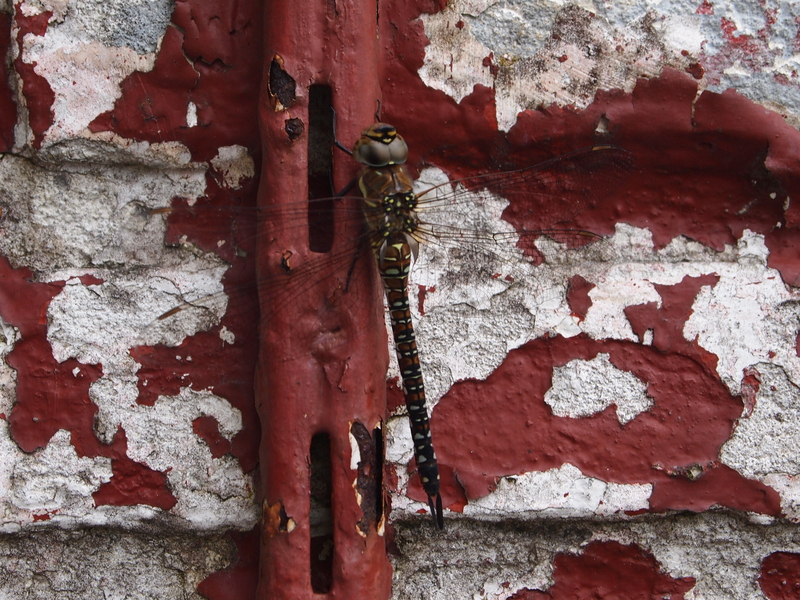 A dragonfly on a wall of fading paint. Everything has its place where it belongs. Sometimes there is an order to it. Other times it is chaos meets time and a situation becomes less temporary. In the whole of what you perceive as where everything has its place in your life, in society and nature the dimensions keep adding up. More importantly when something is out-of-place it indicates something. The dragonfly in the picture was something I saw on a summer day. I saw it, looked again and took pictures while I kept thinking “how did this insect get here?” for which the obvious answer is “by flying.” This picture still makes me think about that instant. Sometimes where you find yourself cannot be explained. In mathematics there are three good examples of number sequences that by themselves explain why a specific number has a specific place in its actual place. The Fibonacci sequence: 0, 1, 1, 2, 3, 5, 8, 13, 21, 34, 55, 89, 144. In short x + y = z, y + z = a and a spiral goes up. Even integers: 2, 4, 6, 8, 10, 12, 14, 16, 18, 20, 22, 24. Even numbers can be divided by two so absolute distance = x + 2. Uneven integers: 1, 3, 5, 7, 9, 11, 13, 15, 17, 19, 21, 23, 25. Uneven/odd numbers are divided by one, themselves, or an additional value. In some cases the uneven integer is a prime number, divisible only by itself and one. Start at 1, absolute distance = x + 2. Human perception has been shaped by nature and nurture (culture) and this influences how people perceive the world. The Fibonacci sequence for instance plays a role in art with the ratios for placing the (main) subject or object in the composition depending on the frame from 1:1, 1:2, 2:3, 3:5, 5:8 etcetera. Usually the (main) subject or object is in the centre thus 1:1 or at 2:3 called the golden ratio. In life “being/feeling out-of-place” is also an interesting thing to think about. Per person this varies in why and how. Some people always want to belong to the in-crowd. Some people do not mind being and staying out. Between these two attitudes a sense of belonging to and communicating with a group of core friends and loved ones stays important. Going from a dragonfly to number sequences to people everything seems out-of-place. This post seems to make sense when you appreciate the four-winged dragonfly which looks out-of-place in the picture. Thing is I feel out-of-place. The dragonfly reminded me again. Posted in Short Reads and tagged art, chaos, composition, dragonfly, even numbers, Fibonacci sequence, frame, integers, life, mathematics, nature-nurture, number sequences, order, out of place, people, perception, to belong, uneven numbers on August 28, 2015 by rura88.